A recent Harvard study has found that economic mobility has not changed substantially in the last couple decades. 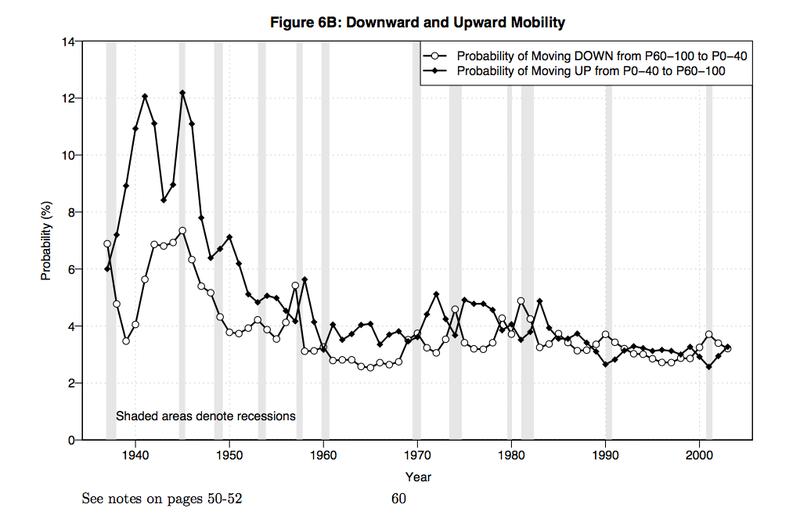 This has been framed repeatedly in the media as “mobility has not declined.” The Times headline is literally, “Upward Mobility Has Not Declined, Study Says”. The NPR headline, “Study: Upward Mobility No Tougher In U.S. Than Two Decades Ago“, captures that story’s spin. Over at the New Yorker? “Social Mobility Hasn’t Fallen: What It Means and Doesn’t Mean“. The reason for this framing is surely that political leaders of several stripes have contended that mobility actually is going down. Remarkably, this has included not only by Obama and other Dems, but also visible Republicans like Paul Ryan. Still, just because political leaders are wrong does not justify using their claims as a starting point. A more accurate headline would be, “Study Finds Economic Mobility Remains Low”. Economic mobility has been remarkably low in the US since the middle of the 20th century. The new Harvard study is a valuable addition to the literature, but it is consistent with years-old studies suggesting that we’ve plateaued near the bottom of the scale. Even the 1960s and ’70s had slightly more variability in mobility and were (on average) higher in mobility. The Harvard study, however, covers the working years of those born in the 1970s and later — that is, roughly the last twenty years. Look again at the graph. There is about a 3% chance that somebody in the bottom 40% will climb to the top 40%, and vice-versa, in a given year. Through 1950, the odds of moving up from the bottom to the top 40% were at least 6%, and as high as 12%, depending on the year. Compared to that range especially, the Reagan years basically saw everyone cemented in place. When mobility is already so very low, and has been for decades, the key finding of this study is not that it has failed to drop further. This is akin to a sports section headline of “Cubs Fail to Win World Series”. Nobody would write that headline. “Cubs Wrap Another Miserable Year” is more like it. This would likely be true even if the GM had promised a title at the start of the year — though the New York Post would probably go with throwing that promise back in his face. Sadly, the reporters who cover economics research know far, far less about that subject than sports reporters do about the games. These headlines are a good example of political coverage only taking place within the boundaries set by policy leaders, even when the facts should militate otherwise. Political reporters and editors don’t know whether economic mobility has gone up or down over the 20th Century; they only know what Paul Ryan and Barack Obama say about it. That’s shameful, of course, when good information is publicly available — much of which is readable to the outsider. Shouldn’t reporters be fact checking whether mobility really has gone down? Asking politicians where they got their data? Reading enough books and scholarly articles (or at least the darned abstracts) to have at least a semblance of an idea where to start looking for such an answer? Regardless, they are not doing so, and it takes the PR flacks at Harvard (who have apparently done their job very well this week) to put such research on their desks. 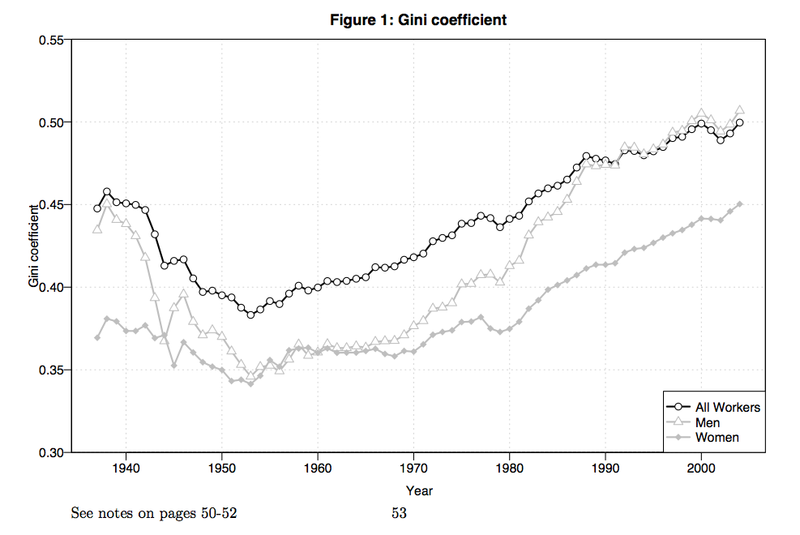 This graph depicts the “Gini Coefficient,” which is a measure of economic inequality. Inequality dipped after the war, and it has climbed steadily since then. This graph stops in 2004, but it has continued unabated in the decade since as well. The study and the coverage are also right to highlight important geographic differences in mobility. A kid who grows up in the bottom fifth in San Francisco or New York City is over twice as likely to reach the top fifth as a similarly positioned kid growing up in Atlanta or Charlotte. (Could it possibly be that collective investment leads to greater mobility?) Check out the Times‘ really cool interactive map of economic mobility. This wealth of great detail notwithstanding, the new Harvard study’s framing in the news headlines and leads is disappointing. “Cubs Not Champions” is not the right frame; this is a lot closer to “Cubs Continue Futility”. P.S. Thankfully, economic inequality is now being treated as an economic problem. In that vein, we should be looking at the political explanation for inequality — which brings me, for the umpteenth time, to Winner-Take-All Politics by Jacob Hacker and Paul Pierson. If you have not read this book and give a gram of care about inequality, go read it now. Even for those with no training in economics or political science, it’s a very accessible — and persuasive — read. This entry was posted in Uncategorized by Bill Herman. Bookmark the permalink.